Home architecture style: Regional or not? 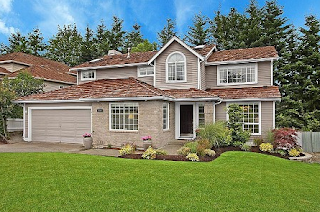 Home architecture styles tend to vary by region and even by state within a region in the U.S. Specific styles of homes can also be unique to one city or state. Watching the opening shots of TV shows, one is often able to pinpoint where the show takes place just by identifying the architecture styles of the homes shown on a street – think of “Full House” and the shot of the Painted Ladies row homes in San Francisco, pictured above. Some of the most popular architecture styles for the U.S. are colonial and ranch/rambler style homes. 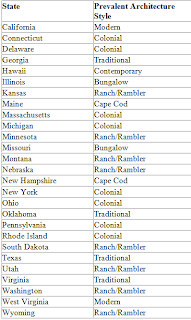 These vary regionally as states with more traditional home styles such as colonial or Cape Cod aren’t as likely to also have contemporary or ranch-style homes. Some states have architecture more in common with neighboring regions than states in the same region. The challenge is that sometimes Realtors list multiple style descriptions for a home and this can cause confusion for the buyer looking for a specific type of home. Let's say you want one floor living, well a ranch is the answer. However and expanded ranch and a colonial will offer bedrooms on the second/upper floor, yet the expanded ranch often has at least one bedroom if nor more on the first floor. Another irony is that most of the area "Tudor" homes are actually colonials, however, the architectural elements applied re-dress a Colonial and turn it into a Tudor Revival style home. Here are some pictures and descriptions of common architecture styles for homes found in the U.S. Not all homes will fall into the following categories, and homes within a category may not look exactly like the pictures below. Bungalows are a type of small craftsman home and typically have low pitched gabled roofs with wide overhangs. Bungalows are typically 1 to 1.5 stories. The name bungalow originated in India and referred to small thatched homes. 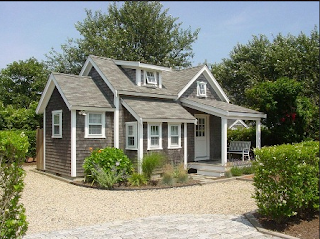 Cape Cod-style houses were originally single-story cottages with shingles on the sides. More modern Cape Cod-style houses have one or more stories with a steeply pitched roof and clapboard or brick siding. Upper floor rooms have sloped ceilings due to pitch of roof, under most circumstances. Colonial-style houses are characterized by high peaked roofs, large central or end chimneys, a symmetrical structure, wood or brick siding and several small double-hung windows. 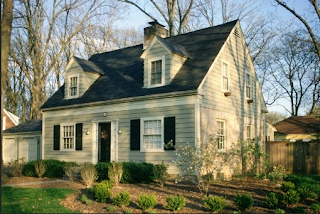 Dutch colonial houses are characterized by the broad gambrel roof that gives them a barn-like appearance. The area I specialize in--which is commonly referred to as the Bedroom Communities of NYC--are dominated by Colonial-style homes. Contemporary homes are a style that is a subset of modern homes. Contemporary homes can have flat or gabled roofs and are usually one story. Large windows and open floor plans are characteristics of contemporary homes. Cottages are small craftsman or cabin-style homes. French-style homes have brick, stone or stucco siding with flared eaves and dormers. 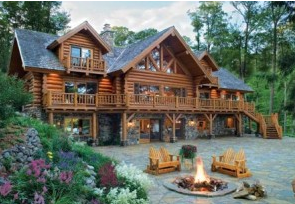 Log cabin/rustic homes are rectangular and can be made of either logs or other materials. Rustic homes are typically made out of wood and made to fit in with their surroundings. Mid-century modern was the typical home style built in California or Western suburbs after World War II. 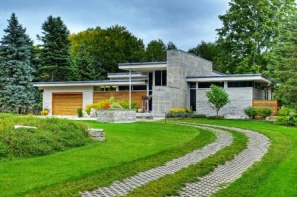 Examples: Frank Lloyd Wright houses and the “Brady Bunch” house. Mid-century modern homes can also be two stories or split level. You can find a lot of homes in this style in the Newstead section of South Orange and also in many sections of Livingston. Ranch/rambler houses became popular starting in the 1920s, with a one-story, rectangular, L- or U-shaped design and an attached garage. The ranch house is noted for its long, close-to-the-ground profile, and minimal use of exterior and interior decoration. The houses fuse modernist ideas and styles with notions of the American Western period working ranches to create a very informal and casual living style. People that prefer ranches prefer one floor living rather than Colonial Homes with multiple level living set off by long staircases. Ranches later evolved into Bi-Level Homes often referred to as Raised Ranches and Split Level Homes-also thought of as tri-level homes. Bi-level Homes have bedrooms, kitchen, dining rooms and living rooms on the same upper level and usually have a family room in the lower level. This family room often opens to the back yard through a sliding glass door as the backyard has to be lower than the front yard. A popular variation on traditional ranch house is a split-level home. Here you can find at least three levels of living, usually a limited number of bedrooms on the upper most floor, the middle level can have bedrooms and/or living, dining room and kitchen and the lower level usually has family room that can open to the back yard; sometimes there is even a small extra lower level for the furnace/water heater area and raw basement. Traditional-style homes incorporate style characteristics from other home styles all in the same home. The following home can be described as traditional, and incorporates some elements from Cape Cod, craftsman and ranch/rambler style homes. These traditional new homes are usually more recently built homes featuring the best of each of the styles or elements drawn upon. Victorian homes are from the latter half of the 19th century. Builders during this period experimented with curved towers topped with turrets, bay windows, patterned shingles and asymmetrical houses. These homes are much more elaborate in design with extraordinary wood trim exterior details, and additional crafted windows on the interior. Victorians are also typified by having multiple fireplaces as that is how most of these homes were heated. The rooms are more plentiful but they are also a bit smaller. Tudor style homes: Actual Tudor Style Buildings would be more like what one would expect of a Gothic Church; However, in the land of homes, we actually should call it Tudor Revival, where he emphasis was on the simple, rustic and the less impressive aspects of Tudor architecture, imitating in this way medieval cottages or country houses. 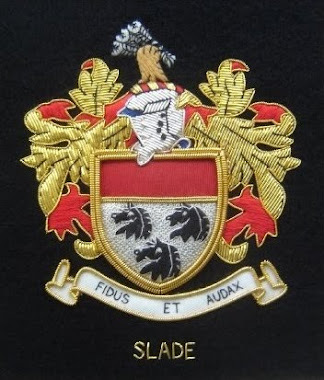 Though the style follows these more modest characteristics, items such as steeply pitched roofs, half-timbering often infilled with herringbone brickwork, tall mullioned windows, high chimneys, jettied (overhanging) first floors above pillared porches, dormer windows supported by consoles, and even at times thatched roofs, gave Tudor revival its more striking effects. 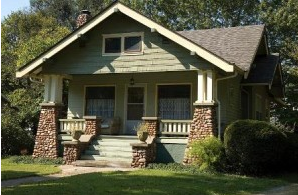 Midwestern states most commonly have bungalow and ranch/rambler-style houses. Kansas, South Dakota, Nebraska, Minnesota, Missouri and Illinois primarily have these styles of houses. About half of the houses in Michigan are the three styles listed above, although Michigan also has about a third of houses built in the colonial style. Ohio is least like the other Midwestern states, most likely due to its proximity to the Northeast. 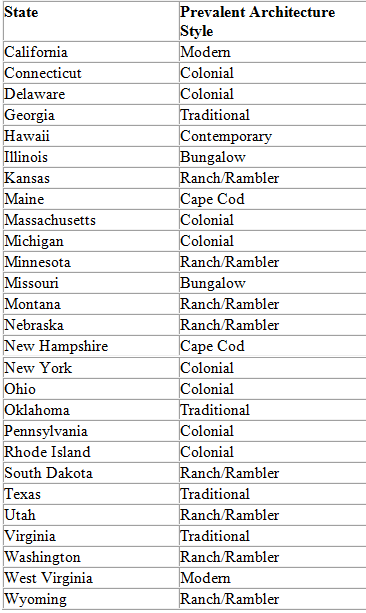 Houses in Ohio are most likely to be Cape Cod or colonial style than bungalow or rambler/ranch style. Midwestern states are also more likely to have pre-fabricated, or manufactured, homes than other regions. Northeastern states generally have colonial or Cape Cod-style houses although some states also have cottages. Ranch/rambler houses are more popular in New Hampshire and Maine, but are not very common in other Northeastern states. Victorian houses are more common in Connecticut, Massachusetts, New Hampshire and Pennsylvania than in other states. Southern states have a wide variety of architecture styles, due to the large size of the region. Delaware is more like Northeastern states, with many colonial style houses. Many homes in the South are described as “traditional.” Traditional-style houses are a style that is used to describe Southern and Western houses but is not used to describe houses in the Northeast or Midwest. Texas is characterized by having traditional and contemporary houses. Virginia has traditional, ranch/rambler and colonial as its most prevalent house styles. Oklahoma houses are mainly described as traditional houses. Georgia has the majority of houses described at traditional, with French and colonial as other common styles. In fact, around 20 percent of the homes in Georgia can be characterized as the French style, which is unique to Georgia. West Virginia is split between Cape Cod, modern (most likely mid-century modern), colonial and log cabin/rustic homes. For western states, Hawaii is mostly contemporary homes. Montana has ranch/rambler-style houses with some bungalows and log cabin/rustic. Wyoming is almost all ranch/rambler-style homes, with a small percentage of log cabin/rustic-style homes. More than half of Utah homes are characterized as ranch/rambler, with about a third described as cottages. 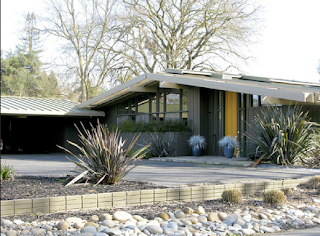 More than half of California homes are described as modern; most likely referring to true modern homes as well as mid-century modern homes typical of California suburbs constructed post WWII. 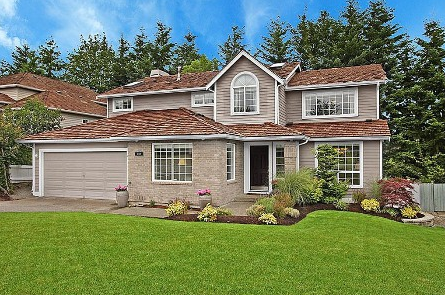 Another fifth of homes in California are characterized as contemporary. 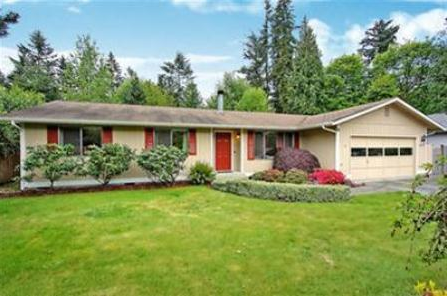 Homes in Washington are mostly ranch/ramblers, with bungalow and traditional as other common styles. The following table shows selected states and their most prevalent home architecture style. For states where we had at least 5 percent of single family residences with an architecture style reported that was not “other,” we calculated the proportion of houses with a particular style for each state.